Son of Thomas Parkinson, who was a farmer at Bryning, near Warton, Lancashire. In 1881 he was a tobacconist's apprentice in Blackburn and by 1901 he had begun a tobacco manufacturing business of his own on Newport Street, Bolton. When he was elected Mayor in 1919 he had served 17 years as a Councillor. In November 1919 one of his first Mayoral functions was to attend the Mayoral Civic Parade at the Parish Church, the theme for the ceremony being War and Peace (this being the first anniversary of the end of the First World War. During his term of office the Royal Lancashire Show was hosted in Bolton (at Lostock) for the first time since 1907. 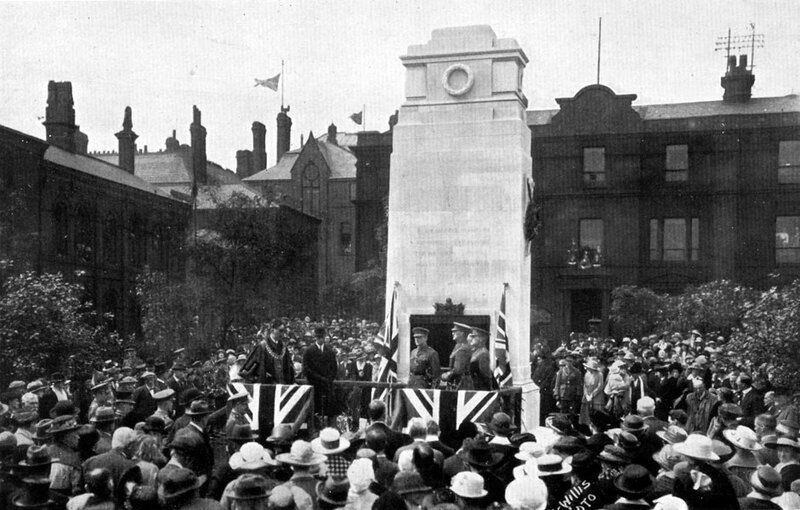 On 20 July 1920 the Duke of York (the future King George VI) attended the opening after he had unveiled the Bolton Artillery memorial on Nelson Square. £20000 had been spent on the showground and the event was spread over 3 to 4 days. The entrance fee for 'grounds only' was 10/6d and the show, with Royal attendance, was definitely a feather in Bolton's cap. The Show was not meant to be attended by the working class as agricultural workers at that time were paid £2 6s 10d and miners £4 for a six day week. On 1 September 1920 he opened the first Council house in Bolton on the Platt Hill estate, the first tenant being a discharged soldier. He was very interested in the education of the young people of Bolton and was a Governor of Bolton School. He was Chairman of the Education Committee when he became Mayor and it was usually considered too much of a burden to continue with this as well as Mayoral duties but he chose to remain as Chairman. He attended many meetings as well as being at the forefront of any event involving the young people of the town. As Chairman of the Education Committee he said that he would by all means in his power try to secure for Bolton the best Technical Education. In 1921 he stated that the cost of education to the town was £324,465 for the previous year and this showed why it was necessary to have a 1½d. Rate increase. He was a Freemason and on 4 October 1921 at the Provincial Grand Lodge of Freemasons, presided over by Lord Derby, he was appointed as Provincial Senior Grand Deacon. Anglican - he worshipped at Holy Trinity Church, where he was married. It was said that "they were a model family - based on service for others, honesty and living a life of faith. They were a true and pure family and where one had that, one had a true and pure town." In 1920 he was present at the blessing of the set of recast bells at Holy Trinity Church. The bells were in situ when blessed, the first time in 200 years that this ceremony had taken place in Lancashire. He lived at 99 Castle Street, now used as the Ukrainian Club. 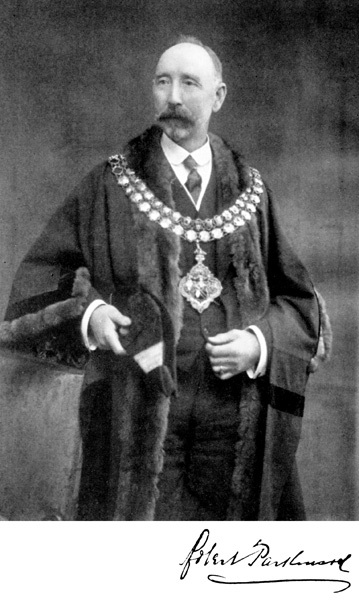 Formal portrait of Robert Parkinson as Mayor of Bolton. Robert Parkinson as Mayor of Bolton with the Duke of York (the future King George VI) at the dedication of the Bolton Artillery memorial on Nelson Square 20 July 1920. 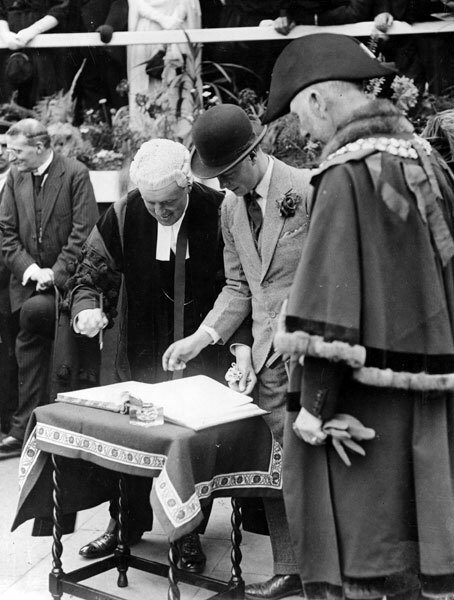 Robert Parkinson as Mayor of Bolton with the Prince of Wales (the future King Edward VIII) as he signs the visitors book during a Royal visit in July 1921. 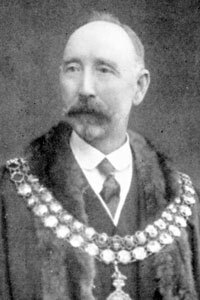 Robert Parkinson's link on the Mayor of Bolton's Chain of Office. Gules on a chevron between three feathers palewise or, three mullets sable. 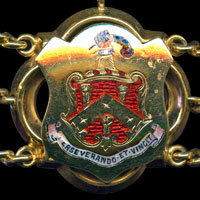 Crest - On a wreath or and gules an arm issuant vested or cuffed ermine with the hand holding a feather argent. 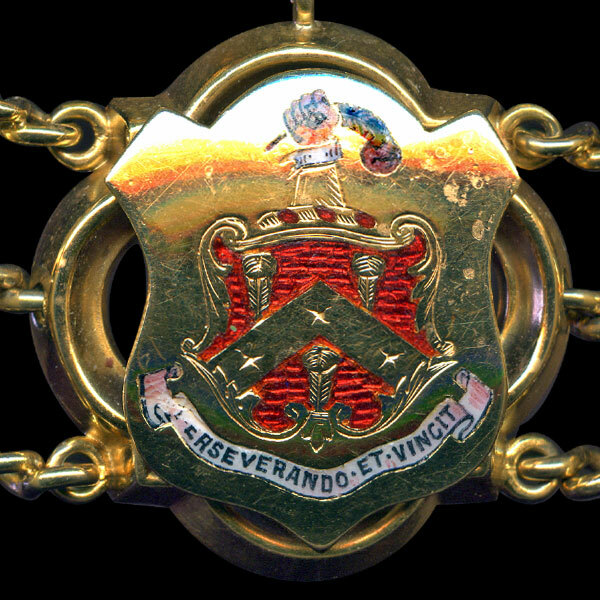 The arms were granted to a Parkinson who was Chancellor of Chester and the family were connected to the Norreys family of Davyhulme but no connection to Robert Parkinson appears to be viable.